I’m a hotel guest experience junkie (enthusiast, if you will). And I can guarantee you that those who know me well, will nod wildly- for different reasons. Some of them will agree because they’ve seen me fight for my right as a customer, one too many times. And the rest, because they’ve spent countless hours listening to me talk about how important it is to be customer-obsessed, in this day and age! Bottomline is- I am passionately and unapologetically committed to this revolution called guest experience management. And as a hotelier, you should be too. You should embrace it so hard, that it becomes synonymous with your brand, aka your niche. 1. Want to increase your profits? Treat your guests right. 2. Modern day guests are not going to tolerate shoddy service. This is golden. With the amount of information (and power) available to the new-age guest, no hotel can afford to lag in their services. In fact, offering a guest experience that is superior to what your competition offers is one of the easiest ways to improve your hotel’s reputation- online or offline. This stat shows that customers, or in the case of the hospitality industry- guests, are more tolerant if the problem they face is product-related or price-related. These are negotiable. But their impatience to deal with service-related issues is steadily on the rise. Not only will shoddy service result in loss of business for you, it will also tarnish your image. You’ll then have to start thinking of ways to handle your Hotel reputation management. And it keeps getting worse from there on. The smart way to go about it all is to offer impeccable guest service, which will only ensure that your competition doesn’t steal your guest. 3. Guaranteeing stellar hotel guest experience will pay (off), literally! If we were to go by this stat, there is absolutely no reason for you to not want to make guest experience your niche! Look at it! People don’t mind shelling out more money if they know they are in safe hands. This stat is most applicable to the hotel and airline industries. Can you imagine how much you stand to gain if you could offer your guest a “guaranteed good experience”? This is your cue to redefine your hotel’s guest experience strategy. Upsell, Cross-sell or just give your guests a premium experience throughout. And make sure your staff is aligned to this too, so they can convince potential customers to upgrade to a better (more expensive) room. But the crux of it all still lies in delivering a great experience. 4. Be present where your guests are- on the mobile! Omni-channel guest engagement has become so important in this day and age that if you aren’t present everywhere, you are sure to lose out on business. A strong online presence is non-negotiable now, given how rapidly mobile is taking over the world. Not only does this mean that you need to have a superb online marketing strategy, it also means that you should engage with your customers (potential ones, included) across all online channels – OTAs, social media, review sites, your own website. Be proactive in your engagement in order to stay relevant. Even in areas of business that aren’t guest-facing, mobile is a great idea. Like investing in a hotel PMS with a mobile app. It helps you stay on top of things, no matter where you are! 5. Unhappy guests can cost you dearly! We’ve told you what you stand to gain by taking your guest experience up a few notches. But here’s the deal- you will be penalized for bad service- and it will cost you a bomb. Hotel Reputation Management is heavily invested in these days and no hotel would knowingly wish to ruin their reputation. Let’s consider the first stat here: a massive chunk of unhappy guests will not complain about the bad experience and most of them will never return to you. The stakes are just too high for hotels in such cases. This is why being proactive in guest feedback management is mandatory, so you get to know what they thought about their experience with you. Enhancing guest experience is one thing, but constantly trying to work on guest feedback is another. Both together ensure holistic guest experience management. The second stat brings to light the absolute power of guest reviews. A guest who has had an unpleasant stay with you is sure to tell anywhere between 9 & 15 people about the experience. And if it were me, I would never go to a hotel where someone I know has had a bad experience. I’d rather take my business to a place that has good ratings, even if the ratings are given by strangers! This is the damage negative reviews bring along. For every single person that is unhappy with your hotel’s guest experience, you stand the chance of losing up to 20 potential guests. The business implications of this is staggering. No hotel can afford these odds. But with the right approach, you can turn tables around and make sure that every customer creates customers by word-of-mouth marketing. 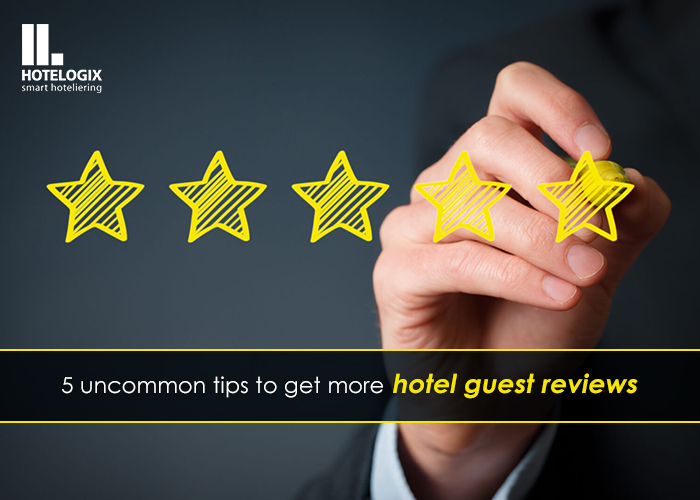 By ensuring that your hotel’s guest experience management strategy is best-in-class, you are sure to reap the benefits of positive reviews and customer loyalty. What’s more! You’ll no longer have to worry about “how to manage hotel reputation” ever again! Do you see how making guest experience your niche correlates to long-term success? We’d love to share with you other ways in which our product can help you up your game when it comes to hotel guest experience and hotel reputation management. Feel free to reach out to us if you want to know more!